Be the first to share your favorite memory, photo or story of Edine. This memorial page is dedicated for family, friends and future generations to celebrate the life of their loved one. 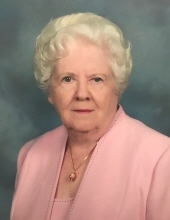 A graveside service for Edine Nesmith, age 93, of Frankston, is scheduled at 2 o’clock in the afternoon Saturday, February 16, 2019 at Olive Branch Cemetery in Brushy Creek. Rev. Doug Howell will officiate. Services are under the direction of Autry Funeral Home, Frankston. Mrs. Nesmith passed away Sunday, February 10, 2019 in Frankston. She was born March 31, 1925 in Winnfield, LA to H.K. and Ethel (McKaskle) Porter. Edine was a former teacher with Frankston ISD. She was preceded in death by her parents and her husband, Norvin Nesmith. Left to cherish her memory are her son, Robert Nesmith of Houston; and daughter-in-law, Cheryl Nesmith of Flint. She is also survived by her grandchildren: Heather Self and husband Brad, Derek Nesmith and wife Vanessa and Holly Nesmith and husband Dennis; and four great-grandchildren: Liam Self, Quinn Self, True Nesmith and Harper Wright. Visitation will begin on Friday, February 15, 2019 and friends are cordially invited to visit with Edine’s family from 5 to 6:30 in the evening at Autry Funeral Home, Frankston. "Email Address" would like to share the life celebration of Edine Nesmith. Click on the "link" to go to share a favorite memory or leave a condolence message for the family.